Most of the people who have basements in their houses either use them as storage spaces or garages. Are you one of them? If yes, then its time you should stop treating the underground space as a junkyard. Why make it the catch all for your clutter when it can be converted into an interesting and exciting space where everyone would love to spend time. With a little effort, the boring basements can become the hallmark of your house. Don’t worry – we have got your covered! Shift all the fun downstairs – convert your basement into an area where all your family members (and guests) can enjoy different games. If you have kids at home, divide the basement into two areas; reserve one for the kids and one for the adults. Have you always wanted a cozy place you could call your sanctuary? Build one in your basement! The idea of converting basement into man cave has been readily gaining popularity among homeowners. It’s all about creating a space in your house that has everything you like. Whether you like to watch movies, listen to music, just want to spend some time away from the normal life, or want it all – create a little oasis for yourself in the basement. If you are a book lover then there could nothing better than having your own library. Since basements are usually quieter than other areas of the house, it can be the perfect space to enjoy a good read. This will not only make reading much more enjoyable, but also save you from running to the town library every now and then to find some peace and read your favorite author’s new book. Whether you are a move buff or like to enjoy Big Game with your friends, building a home theatre is an amazing idea. 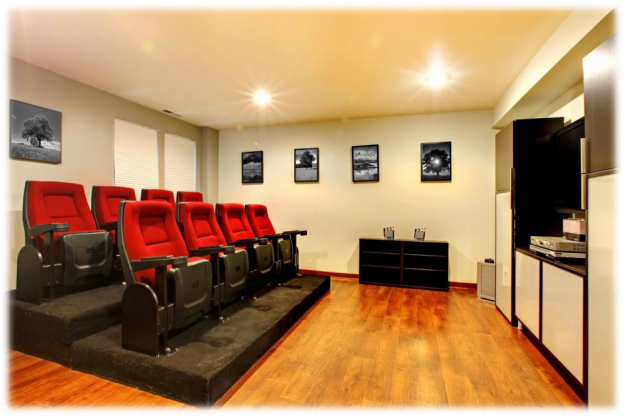 With no noise and disruptions, basements offer perfect conditions for home theatres. To make the theatrical experience even more wonderful, install a mini fridge and a popcorn machine. There’s so much you could do with your unfinished basement. Take inspiration from these ideas, let your creative juices flowing, or talk to the experts at SALT – the best company for basement finishing in Bluffdale, UT. Why make your basement the catch all for your clutter when it can be converted into an interesting and exciting space where everyone would love to spend time. Read the article to get some basement remodeling ideas. Should I Have an Open Basement Stairwell?